This past Monday I attended a professional development focused around technological infusion into our teaching. I will be the first to admit that this topic is not often tailored toward the math teachers in the building. In the morning, virtual classrooms and movie making dominated the discussions. I didn’t see the implications for my mathematics classroom, until the afternoon. A facilitator introduced me to the SMS text messaging technology of polling. I had first heard of the idea in university when certain classes included a “clicker” in the required materials. In my case, a biology professor could ask a question and instantly get a gauge on how well topics were being understood within the lecture. Polling technology essentially does the same thing by turning every student’s cell phone into a clicker. From there, creating multiple choice and open-ended polls took literally seconds. I explained the response procedure to each of my classes, and demonstrated how the results may look. This procedure took about 10 minutes per class. After that initial day, students were instructed to bring their phones to class in the event that I needed their feedback. Results were broadcasted on my SMART board. For a quick demonstration on how to actually run the software, see the video link below. It is so intuitive that it does not take long to pick up. After a week of playing with the possibilities, I deciphered five immediate benefits from the technology. I over-integrated it initially to (a) make the students familiar, and (b) develop a pool of situations with which the technology is helpful. 1) One-Hundred Percent Student Response. I know that teachers have a daily struggle engaging the few outliers in each classroom. Sometimes even the most potent diagnostic tools miss students. I can not begin to describe my bewilderment when a student that I have tried for months to reach pulled out their phone to reply to the poll. The results are completely anonymous; this fact, coupled with the familiarity of the technology, creates a comfortable situation for students. There is no spotlight–no hand-raising. Every student who had a phone (~95%) responded to EVERY poll. This created the most accurate diagnostic tool I have ever used in my classroom. 2) Gauge the Class Dynamics. Every class has its own personality, and every class encounters the material in different ways. I have two sections of Pre-calculus 20 (Grade 11) this semester. One section lost some class time due to a pep-rally and were rushed through the topic quicker. My teacher instinct told me that students in the rushed class would need more time on the topic. I set up a quick poll asking them to respond with the method of solving quadratic equations they needed the most help with. To my surprise, the case was completely the opposite. Over half of the class told me they would like help with a previous method. It took a little scrambling on my part, but their responses changed the course of their class-time. I was not discrete with this information, and students enjoyed the new-found power. One even joked that we should poll when they wanted the tests to be. 3) Drill and Response Type Questions. This was given to a class just starting the topic of slope. I knew the most common mistake would be to count the run over rise instead of the rise over run. Students also are initially confused with the nature of positive and negative slopes. When do you rise? When do you fall? Which is negative? etc. In this case, even though only 55% of students answered correctly, I was able to address everyone’s problems. As the class went on, I noticed a drastic reduction in these errors because every student held ownership of a response. 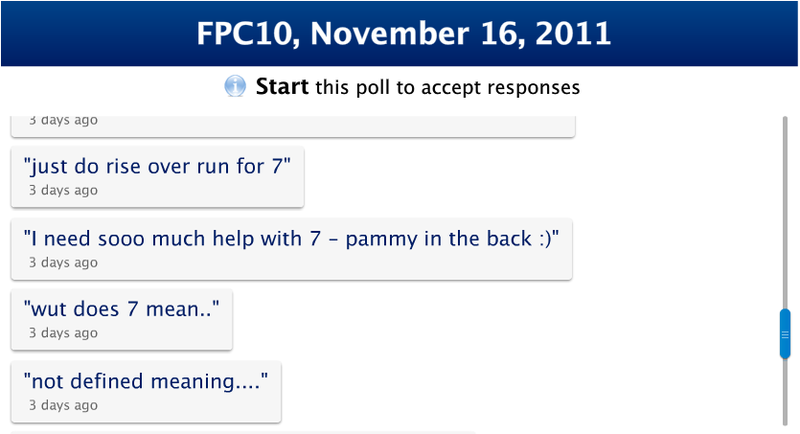 I also had students create polls if they finished work quickly. Not only was this a great motivator, it provided them a chance to predict common mistakes and give explanations. polleverywhere.com also allows for open ended polls where short messages are projected on the screen. I was weary of allowing students to put anything on the board with complete anonymity, but after a few glitches it became a powerful review tool. Students were encouraged to ask questions with the poll. I told them to watch to see if others are having trouble with the same problems. Some students physically moved to be with those like-minded students. Others offered advise with the texts themselves. It reduced the amount of times I had to explain the same procedure, because those having trouble congregated. One class actually organized a study group for the next day with the poll. Students could text in for help and move on to the next problem knowing I got their request. I had a grade 11 student ask for help for the first time in 2 months using this format. I am not going to deny that there were growing pains with this freedom, but after an initial feeling-out process, it was a powerful tool. 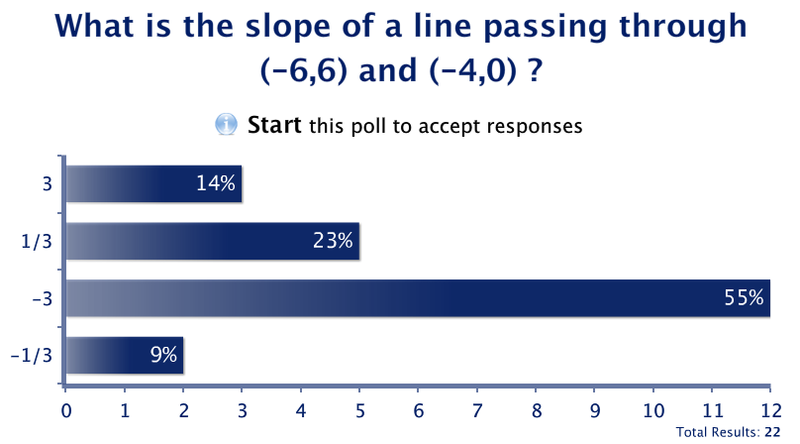 The first question I polled was one on ‘rate of change’. I hid the graph of responses while they worked and texted in (to avoid peer pressure). When I clicked the “reveal graph” button, each response had received exactly 25% of the vote. This fact was met with an audible groan from the class and spawned a VERY teachable moment. I asked the class what was wrong. They had made the immediate connection that this meant that 75% of them were wrong no matter what. I continued to poke this bear for a while. What if we had 100% on one response? Is that better or worse? What percent would you need to feel comfortable? etc. That experience was bitter-sweet for me. On one hand, students were confused topically, but on the other, they were interpreting the data correctly. It got the class using skills that are important for any numerate citizen. I never imagined the immediate effect that polling would have on my class. It goes far beyond the superficial attachment that students feel to their phones. Polling did more than engage students in the lesson, it provided a connective and collaborative tissue. I look forward to finding more ways in which the technology can better the learning environment in my room. Great use of technology in the Mathis classroom! The poll everywhere is an example of a formative assessment tool which gives feedback minute by minute to the teacher. Dylan Wiliam supports this as a great way for the teacher to check for understanding! This also helps differentiate the learning as your students were grouping together based on similar responses! Good way to model transformative uses of technology! I was worried that there was too much emphasis on the tools on our PD day, but it's great to see that you were about to connect the tool and examples of their use with the context of your classroom.